For his entry to The Hackady Prize, [Sean] is building a haptic vest for gamers and the visually impaired. It’s exactly what you think it is: a vest with proximity sensors and motors that wrap around the wearer, providing haptic feedback of nearby obstacles. Actually building a vest with a few dozen motors is a bit of a challenge, and that’s why this project is in the running for The Hackaday Prize. Each of the 48 motors are individually controllable with PWM. In any other project, this would require a few dozen microcontrollers or one with a whole lot of pins. [Sean], however, is using LED drivers. They do exactly what [Sean] needs them to do – an easy to interface way of a whole bunch of PWM lines – and they do it cheaper than any other solution. For detecting objects surrounding the vest, [Sean] is using the depth sensor on a 1st gen Microsoft Kinect. In testing, [Sean] blindfolded a volunteer and had a few friends move around with cardboard ‘obstacles.’ The volunteer successfully avoided all the obstacles, as seen in the video below. [Finchronicity] over on Hackaday Projects has made a pretty awesome furry LED Vest to keep him warm and well lit at this year’s Burning Man. He is using a Teensy 3.0 that drives strips of 470 WS2811 LEDs. 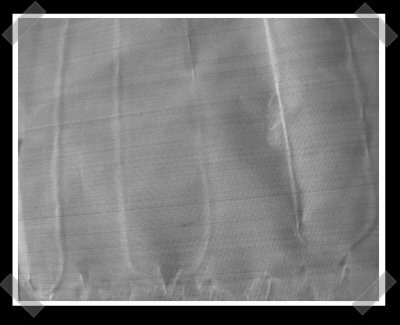 The vertically aligned strips run on a continuous sequence which reaches up to 31 frames per second using precompiled animations. The effects rendered in Processing or video mapped, are captured frame by frame and stored as raw color data to an SD card. Playback uses the NeoPixel library to control the strips. The high resolution LEDs, with the video mapped fire and the long pile fur, create one of the nicest flame effects we have seen on clothing. We’ve also seen the Teensy 3.0 and WS2811 LEDs used as a popular combination for building huge displays, a 23ft tall pyramid, and more recently in the RFID jacket at Make Fashion 2014. Have you made or seen a great Teensy/WS2811 project you would like to share with us? If so, let us know the details in the comments below. [Mykle Hansen] is an avid cyclist, and safety is a big concern for him. He says that bicyclists often receive a lot of honks and grief from passing motorists because they perceive them as moving far slower than they really are. According to [Mykle], this misjudgment can result in “right hook” collisions, which kill several bicyclists each year. 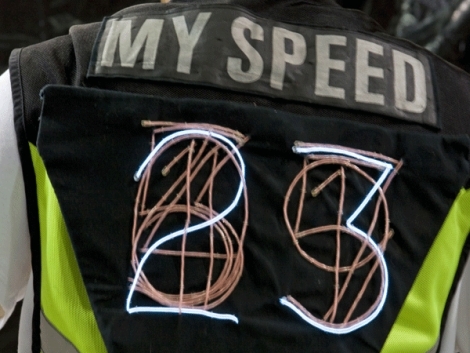 To increase his nighttime visibility and to give drivers a better idea of how fast he’s traveling, he constructed a bicycling vest that displays his current speed in large 7-inch tall numbers. He uses an off-the-shelf speedometer to get his current speed, feeding that data to an Arduino tucked inside his vest. The Arduino then lights the appropriate EL wire digits to relay his speed to motorists behind him. It seems to work pretty well if the video below is any indication, and there’s no denying that it will catch a driver’s attention at night. If you’re thinking of making one for yourself, check out his Make:Projects page for a complete look at how it was put together.